This year a new police station will open in Shepton Mallet, based at Haskins Retail Centre in the town centre. Shepton Mallet police station will house an enquiry office open to the public as well as a base for the local neighbourhood policing team and the patrol team for the Mendips. It is expected to open in summer/autumn 2019. This move confirms the commitment to keep the local neighbourhood policing team in the heart of the community. The new police station will replace the current neighbourhood police base at Mendip District Council. In the Mendip area there is also a need for a police station to house patrol officers who respond to the 999 and 101 calls received every day. The new police station in Shepton Mallet will provide this base, located close to the main roads and the demand faced. Patrol officers from Wells and Frome will move to Shepton Mallet. Wells – The local neighbourhood policing team will remain in Wells. A new police station is being sought with the preferred option to co-locate with Devon and Somerset Fire. 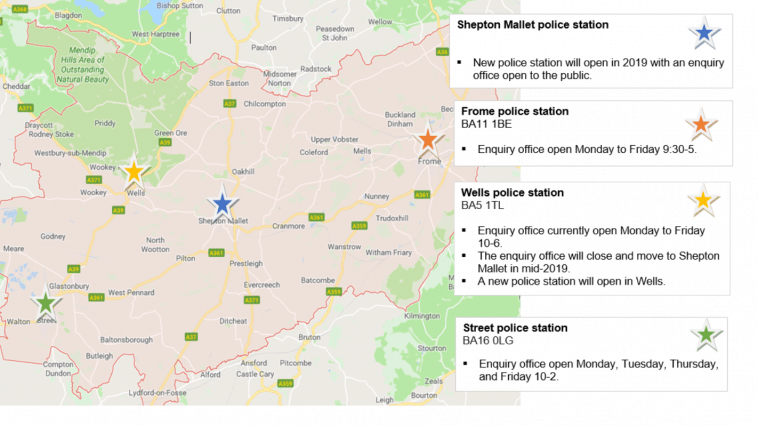 The enquiry office is moving to Shepton Mallet. Frome – The local neighbourhood policing team and enquiry office will remain as they are now. Street – The local neighbourhood policing team will remain in Street. Future options for the police stations are being reviewed. Chief Inspector Sharon Baker said: “The new police station will provide a hub for our police officers and PCSOs in the Mendips and we are looking forward to having a central and visible base. Avon and Somerset Police and Crime Commissioner Sue Mountstevens said: “This is an exciting time for the Mendip area. I’m pleased we can finally announce our plans which include a new purpose built station in Shepton Mallet fit for today’s policing, as well as a continued focus to remain in our core areas such as Wells and Frome.